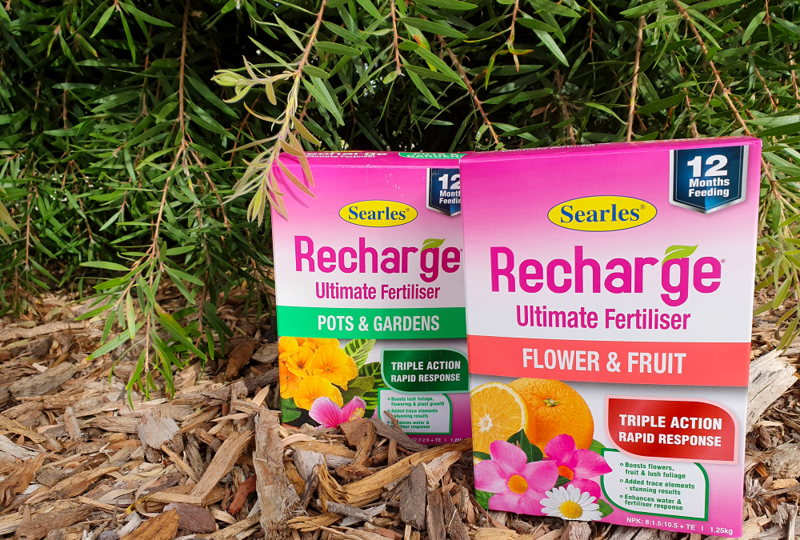 Searles have really given us the ultimate fertiliser with their amazing new product, Recharge. It begins by delivering water and nutrients straight to the root zone with Penetraide, and getting rid of any water repellency. Old soils often become quite hydrophobic and the water will bead and run off the surface. The Penetraide will ensure that the roots soak and receive the water and goodness that they need. You can see the different fertilisers! Recharge looks absolutely incredible when you open the box. It’s a real rainbow of nutrients! 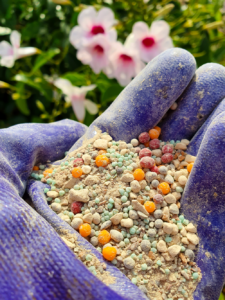 Once thrown on the garden, the scientific blend of fertiliser (both rapid and slow release) get to work, each releasing at different overlapping times so that the plants get an entire feed over 12 months. It means that once you’ve put it on your garden, you can be assured that it’ll do a year’s worth of feeding for minimal effort. It’s available in 1.25kg packs, in both Pots & Gardens and Flower & Fruit, depending on where you need it. Note that the Flower & Fruit blend is suitable for natives too, which is a great bonus! The result is lush foliage and fabulous flowers, plus faster and stronger growth.